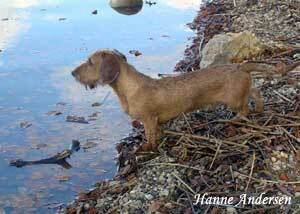 In June 1992 I became literally charmed by a red female of wirehaired Dachshund; I was very excited in waiting for her litter till I could choose my first “blond puppy”. Since then, firmly and passionately, my sister Lucia and I are applying ourselves to maintain this variety of coat, so rare in Italy. 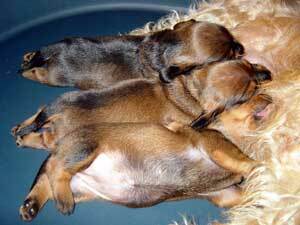 The litters we have got till now are surely not enough in order to get out a theory about the red colour in wirehaired Dachshunds. My article purpose is to pass my experiences on everyone who wants to improve his knowledge, mainly about coat qualities and colour recurrences in litters. The trial began in 1992 and involved 4 red subjects (Rf1, Rm1, Rm2, Rm3) and 9 wild boar subjects (Wm1, Wf1, Wf2, Wf3, Wf4, Wf5, Wf6 Wf7, Wm2) (See PDF Schedule: 4,19k). FIRST LITTER (August 1992, Canterana Kennel). Of female Rf1 and male Wm1 were born a red female, three red males (among them Rm1) and a wild boar male. In this case blond subjects are in higher percentage. SECOND LITTER (December 1994, Canterana Kennel). Of female Wf1 and male Rm1 were born a red female, two red males (between them Rm2) and a wild boar male. Mainly red colour once more. Of female Wf2 and male Rm2 were born a red female, a wild boar female and a red male. This was the first litter I have got myself; looking after them passionately, I could put forward some ideas. At the beginning I got two red puppies of three, both sexes, so I thought it was easy to get blond subjects, but I was completely wrong. Lately, I could notice the different quality in their coats. Wf2’s coat is not very good, otherwise Rm2 has a good texture. As a result one red puppy takes after its mother and maybe the other is better than its father. Of female Wf3 and male Rm2 were born two wild boar males only. Unfortunately, one of them died within fifteen days. This sad and discouraging event (we fed it ourselves because of the mother’s refusal) forewarned me how hard it was to get and breed a blond subject. Next attempt was really better; it involved once again Wf3 and Rm2. This time were born three wild boar females and two red males (among them Wf7 and Rm3). Once more the female was Wf3 this time paired up with Rm1; of them were born four wild boar females and a red male. It was the third time I was using the same female paired up with two different red males, in all I got twelve puppies but only three where red. Wf3 is a dark wild boar Dachshund with a good coat and a few beard, to be clear she is one of those Dachshunds “who never needs to be stripped”. At first I thought that a red subject paired up with a dark wild boar one should give a higher percentage of wild boars. Moreover, I could observe eleven blond subjects, by this chance I understood something more about their coats. The darker (red or almost black) a puppy bears the better its coat will be. Often, few hours after the birth, it is easy to mistake a red subject for a wild boar one. Now, I learnt promptly to notice a discriminator, in fact, blond subjects never show markings on their paws. Within the first month from the birth “an inexpert” could still be wondering which colour his puppy will become. Although in a low percentage, few dark hairs cover his muzzle, tail and backbone. The Dachshund will get a uniform coat with its first stripping, at the age of six-eight months. I took myself care of these three litters, whose two females almost daily. I am still monitoring every subject and I come to the conclusion that, in order to get a blond subject, Wf3’s coat is “the right one”, in fact, it breeds not only stronger red puppies but also dark wild boar ones with a thicker, right length coat. I am just working on both colours by this way. From Wf4 and Rm3 I got six puppies: four red subjects (two females and two males) and two wild boar subjects (a female and a male). 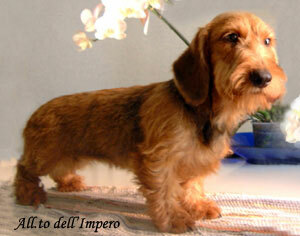 The red breeder, a quite wide haired Dachshund, is one of those I sold. The female, a dark wild boar, has a very good quality coat; she nearly lacks defences. This time the high percentage of red puppies denied my expectations. A deeper knowledge will take lots of births and pairings, anyway, the six subjects coat is a very encouraging result: a male and a female coat look like their mother one and it is red! At the “World Exposition in Milano” I saw a wonderful Dutch kaninchen with these same features, well I thought it was my own goal to achieve. Now, one of the two wild boar subjects has got its mother coat even improving her defences. Maybe, we are on the right way. The pairing up of Rm2 and Wf5, a wild boar female whose coat is nearly alike Wf2, gave birth to a couple of red puppies, female and male, and a couple of wild boar puppies, female and male, confirming the results we got with the third litter: coat good in quality even if not excellent. NEINTH LITTER (March 2001, Canterana Kennel). Of female Wf6 and male Rm2 were born a chocolate female and a red male. The litter, even if composed by such a small number of puppies, confirms our research. Wf6 is a very good haired subject; she gave birth to a male with a “desirable” coat. Moreover, just a surprise: both Rm2 and Wf6 have the recessive allele “b” of chocolate colour. Cheered by good results and always in search of a red female “with the coat I want”, I tried again to pairing up Wf3 and Rm2. I got a wild boar, stillborn female and a red female that, even still very young, seems won’t let down my expectation. This is my own experience on different coat varieties and about the two colours influence in the pairing up. There is a question I often wonder and which I’ll answer by a “field research”: can I get a blond subject by a wild boar Dachshund of mine? Wf7 paired up with the wild boar male Wm2 gave birth to two wild boar males. Wf7 is a female of mine I sold. I refer this for “news’s duties”, in fact, I know very well that the litters I am waiting for wouldn’t be enough to discover if a red puppy will bear from a wild boar Dachshund of mine; it will take more time and more… Dachshunds. Of this pairing I don’t even know the father’s pedigree and if he has any red genes. Probably, who has worked for a longer period on the red colour could have more knowledge about it. I can’t suggest any hypothesis, but the literature I read about told that Dachshunds have the allele “ay” (which is a dominant on “at”, the wild boar colour allele) which is responsible for the red genotype. 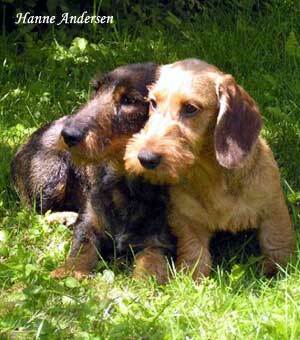 I believe that none of mine wild boar Dachshunds born of a red of mine could ever give birth to a red Dachshund. The red colour is a dominant character so it can’t be transmitted in a recessive way.